This is the beginning of the Diving into PHP class. In here you will get started with writing PHP code! Learn about how to do arithmetic and work with the math properties and methods provided natively by PHP. Learn how to shorten your code by utilizing loops like for loops, while loops, do while loops, and for in loops. Classes in PHP provide a blueprint for the creation of objects which helps organize our code and reduce complexity. Learn how to express dates and time using PHP's built-in date and time classes and functions. Learn how to make your website more dynamic by handling input data from forms using GET and POST requests! PHP allows you to include the contents of another PHP file anywhere you want by using the include and require functions. Learn how to work with the file system in PHP including how to open, read, write, and close a file. JSON is the language of data transfer on the web. 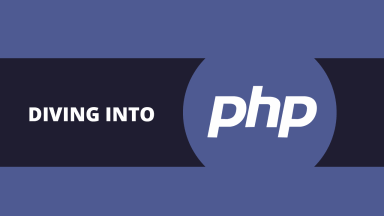 Learn how to encode and decode JSON in PHP. Cookies are small pieces of data that you can store on the client. Learn how to work with them in PHP. PHP sessions allow you to store temporary information about a user on the server like logged-in state or username. Learn how to handle exceptions so that when they happen you can recover gracefully and allow for the script to continue.